As week one of The Kitch’s vacay comes to a close, I can only say that while I’m sorry to have seen this week pass by so quickly, I’m mostly just stoked for the second week off that lies ahead. It’s been a time of change and I’m looking forward to taking the blog in new and exciting directions. The first week of vacation has been a blast. There’s not much better than eating out when you’re on any kind of vacation, and I’ve been doing plenty of that in the name of staying inspired. 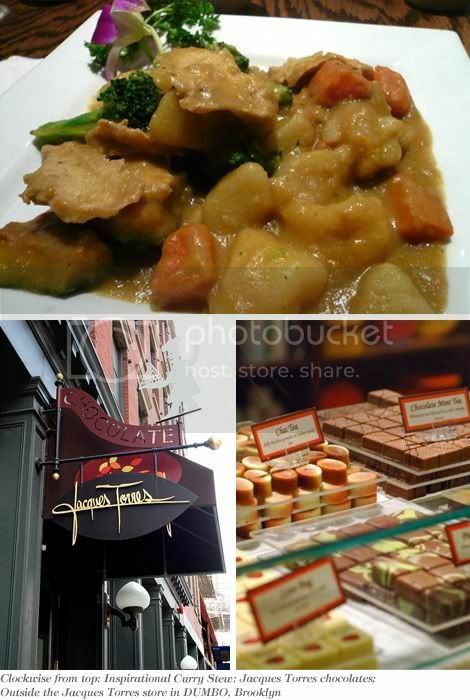 This past Saturday I had a pure vegetarian Malaysian Curry Stew that will hopefully be making an appearance here in the recipes section when I return to The Kitch full-time; and earlier in the week I spotted some lovely chocolates at Jacques Torres in DUMBO, Brooklyn that are begging to be veganized. Beyond plenty of new recipes, I’ll be sharing some behind-the-scenes peeks at prop-shopping and progress being made on my growing test kitchen to develop and shoot recipes in, plus some thoughtful answers on safe ways to incorporate soy into a vegan diet from an instructor at the Natural Gourmet Institute. And? Some new adventures with a Recipe Trial Club made up of myself, and fellow NYC foodies and pure veg friends Dawne Eng, Matt Hagedorn and Terry Hope Romero. 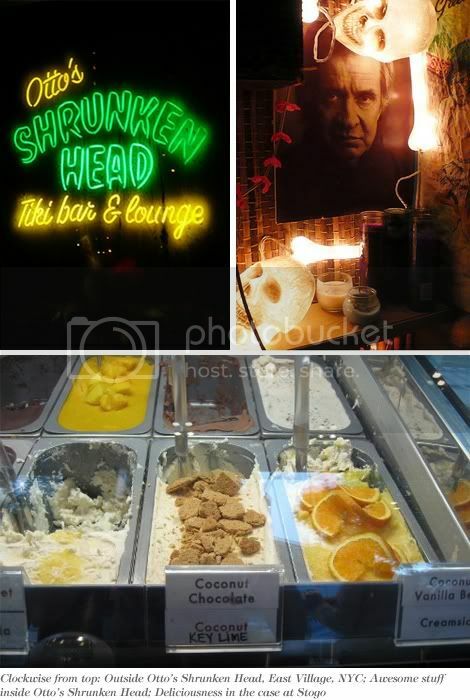 Last week we met for drinks at Otto’s Shrunken Head to make our first plans over an order of awesome vegan grub, and then trekked to Stogo for a late-night gourmet non-dairy ice cream treat. The Kitch will return full-time on August 21. I hope you'll come back and join me for more mouthwatering pure vegetarian recipes and all-new Culinary Adventures in my Unconventional Kitchen!